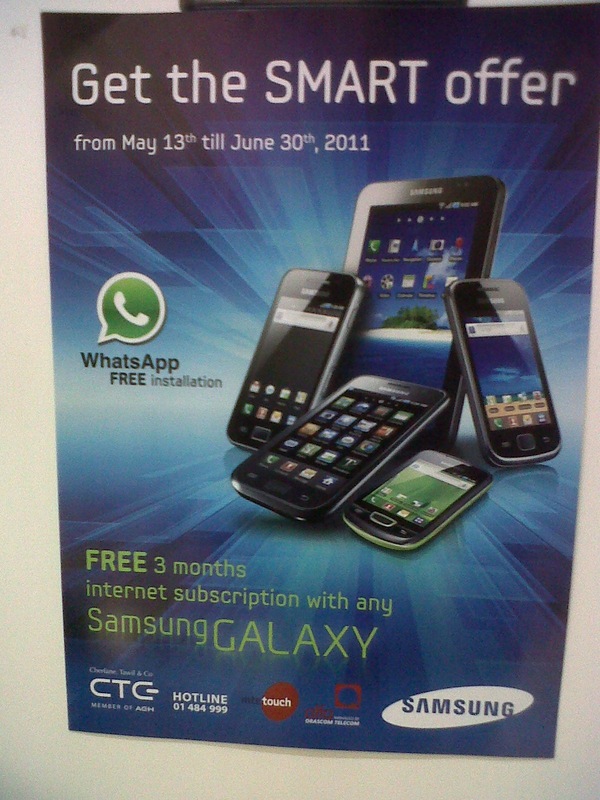 I am starting to really enjoy the "Only in Lebanon" marketing section. Here's a new one for you people. Sometimes it takes a foreign look at things to see how absurd our advertisements can be. @spicydesign had the courtesy to open my eyes on this one while he was visiting Lebanon. ...and where else would anyone advertise "free Whatsapp installation"? Only in Lebanon, my friends. 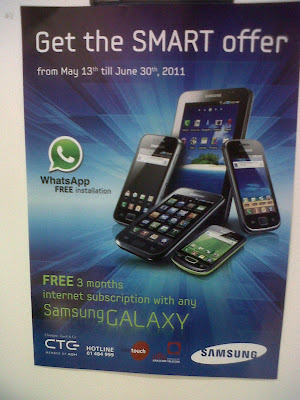 It doesn't take two to figure out they are trying to position this Samsung mobile phone to compete with Blackberry. What does it say about anyone who buys this Samsung Galaxy phone, "I didn't know how to install Whatsapp, so I bought a Samsung" ? Nokia radio ads in the UAE also mention that the new N6 comes with Whatsapp and Linkedin apps preinstalled. when I saw this ad, I laugh too, and at first I tried to convince me that I misunderstood! I think people can be not to buy the product but now if the ad was a certain level of intelligence and truth, he will keep it in mind . 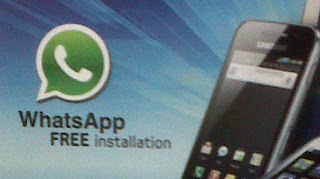 They are trying to compete with iPhone , since WhatsApp on iPhone is Charged for 1 USD. Samsung Galaxy's OS is Andriod, they have a powerful OS as well as a unique Dual Processor Hardware, so i think they should have focused on the performance side more than the what's Up free of charge. Not only the message is stupid, but what scares me the most is the clumsiness of CTC : DID YOU KNOW THAT WHATSAPP IS AN ISRAELI PRODUCT MADE BY AN ISRAELI COMPANY ?? 2- According to the LEBANESE LAW, you are not only using a product MADE IN ISRAEL, but you are PROMOTING IT PUBLICLY. I mean how stupid can you get ? ?